Palestinian medical sources reported on Wednesday evening that the 10-year-old child was wounded by a rubber-coated bullet fired by the Israeli army at protesters near Beit Ummar town, north of the southern West Bank city of Hebron. Mohammad Ayyad, spokesperson of the Palestine Solidarity Project, reported that the residents held a protest near the Carme Tzur illegal Israeli settlement, and demanded to be allowed into their farmlands. 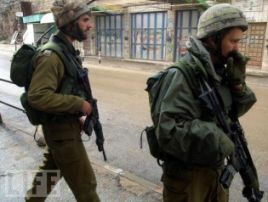 The army and fundamentalist settlers have been closing the area and preventing the residents from reaching their farmlands. It is worth mentioning that the father of the child was attacked two days ago by a group of settlers who also fired live rounds into the air to force him out of his lands in order to build an illegal settlement outpost.